British evacuation from the continent was finally complete and, overall, a success: some 144,000 returned to UK. Left behind in France were aviators and air force personnel of the subdued nations – Poles, Czechs, Belgians, Dutch. Up until the Armistice they were considered as friends and potential combatants alongside the French Army. Now as the latter abandoned their arms and fell into disarray, their prospects in France changed overnight. Staying behind meant laying down their arms and a future of perilous hiding from the Germans or captivity. Britain was the obvious haven, but in the absence of organized evacuation, getting there was a matter of own resourcefulness and ingenuity. Belgian aristocrat Rodolphe Count de Hemricourt de Grunne had an interesting career as a pilot. His combat experience dated back to the Spanish civil war, where he spent three years as volunteer on the side of the Nationalists, flying a Heinkel He 51 and Fiat CR.32 biplanes and scoring a whopping 14 aerial victories. In Belgium, de Grunne was one of the selected pilots of 2/I/2 “Les Chardons” on Hawker Hurricanes, the most modern fighter unit of the Belgian Air Force. When all their aircraft were destroyed during the first days of the war and their country overran by the Germans, the personnel of 2/I/2 evacuated to Southern France to wait for new aircraft under the auspices of Armée de l’Air. The aircraft never arrived, and pilots and ground personal had a safe, if frustratingly uneventful life until the French capitulation. Receiving the news about the armistice, Rodolphe decided that he did not want to come back to an occupied homeland. With some comrades, he deserted from the French Air Force to go to Great Britain. They left for England on 20 June onboard the British passenger ship SS Apapa, reaching Liverpool on 7th July. Czech pilot Josef Emil Hybler fought with Groupe de Chasse II/2 at Laon. His unit retreated via Paris and Chateaudun and ended up at Chissey. After the collapse of the French Army, Hybler flew south. Leaving his aircraft at Montpelier, he continued by coach to Port Vendres close to the Spanish border. There, on 20 June he boarded a ship for Oran. Once in Africa, Hybler went by train to Casablanca, got on a ship to Gibraltar and then sailed in a convoy to Liverpool, arriving there on 12 July, a record time for such a long journey. The Poles were the largest group of foreigners in France. Having previously experienced defeat and exile from their own country, and subsequently smuggled thousands of their personnel from Romania to France using bogus passports and civilian disguise, they excelled both in organisation and improvisation. As soon as the intentions of Pétain’s government were revealed, Polish leader General Sikorski flew to London for a brief meeting with Churchill. The latter’s verbal assurance on Britain’s intention to continue fighting and the promise of accepting the Poles onboard British ships was all that Sikorski needed. On the same day, he issued and order to all Polish personnel in France to head for Britain. In fact, due to this rapid action the entire divisions could be evacuated by sea using the last available French ports. On 19 June, 2,700 Poles escaped via St Nazaire and 4,000 through La Pallice. When St Nazaire fell, further 25,000 were successfully evacuated during the following days from Gironde, Bayonne and St Jean-de-Luz, the last free ports near to the Spanish border. “On June 16th I had flown to Bordeaux, reportedly to defend the French government. This is where we met the end; on the 18th we heard Pétain’s speech about the armistice. There I also encountered Zdzislaw Henneberg, who was planning to escape on a Bloch to England. I myself received an order to wait and was informed that I was to go to Africa. [However,] the following morning my new commander mjr Rabatel confiscated my aircraft and without even saying goodbye told me to do as I liked. In the afternoon, I barely managed to secure a place on a coaler bound for England. In the meantime, our mechanics with lt. Franciszek Skiba were speeding by car towards the shore. 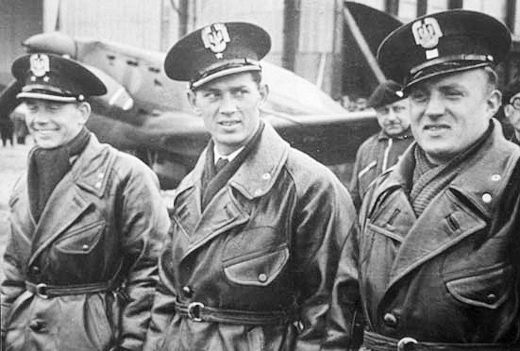 Zdzislaw and the rest of his pilots landed by the harbour. I should also mention that por. Skiba, Antolak and ppor. Marciniak joined with us in Villacoublay. “Our situation was particularly difficult. For the second time in this war, bad fortune hit us with a bitter blow of defeat. We were in a foreign country, among our ex-Allies, for whom we were of value only for the duration of hostilities. Now we had become a liability. We knew that we could depend only on ourselves and that we had to act quickly, before the French authorities recovered from the surprise [of the news]. We could see only one way out – going to Britain. I summoned an improvised war council, in which beside myself there was Capitaine Rougeven and kpt. Wiorkiewicz. I was of the opinion that we should immediately fly to Cherbourg or Brest, and from there speed on to England. However, Rougeven, who was resolved to follow with us, objected to such a project. He claimed that according to reliable information, the British opened fire on every French aircraft in the belief that these were operated by the Germans. He also stressed that we knew nothing about the situation on the airfields in northern France; the enemy had advanced so rapidly that the airfields could already have been lost. And even if we could use them, there awaited a long hop over the sea, which in itself was full of risks. We would drown together with our airplanes. Instead, he said, we’d rather be heading south, find some long range aircraft and use them to fly to Africa. Because this idea was supported by Wiorkiewicz, I had to concede, even though this detour to England wasn’t much to my liking. We agreed then that on the following day, we would fly to Gaillac, a few dozen kilometres north of Toulouse, where there was a flying school for our [Polish] bomber pilots. Undeterred by this setback, the Poles acquired two Caudron Goélands, twin-engined passenger aircraft also used for training of bomber pilots. They had just the required capacity and range to bring the fourteen pilots to Algiers, but not one of them had experience with multi-engine aircraft. Luckily, Rolski found two Polish instructors from Gaillac who agreed to fly them. Leaving behind their Moranes, the group headed to Toulouse, arriving there on 20 June. “On Toulouse airfield we found dozens of Dewoitine D.520 fighters. These aircraft went into service with the French Air Force only recently and were equal in performance to the German Messerschmitt 109. We learned that all these aircraft were simply abandoned – anyone could take one if he liked. All were brand-new and fully equipped. We resisted the temptation because we did not know their technical state or radius. As it turned out later, their range was not greater than that of the Morane and a few of our pilots who got tempted to use these Dewoitines and flew unprepared towards Africa drowned in the sea. The two aircraft moved on to Perpignan, where Rolski finally located a school atlas with maps of Africa in a bookstore, some food and wine for his crew plus sixteen rubber car tyre tubes. The latter were intended as makeshift sea rescue equipment if ditching was necessary. The two heavily laden Goelands took off from Perpignan in the morning hours of 23 June. Four hours later, fighting the headwind over the coast of Algiers, Rolski’s “airliner” landed in Oran on last drops of fuel. Arriving in Liverpool via Gibraltar on 16 July 1940, Rolski was to command No. 306 (Polish) Squadron RAF in Britain.